t’s looking to be a great event, if you haven’t booked a ticket yet there is still time to do so. 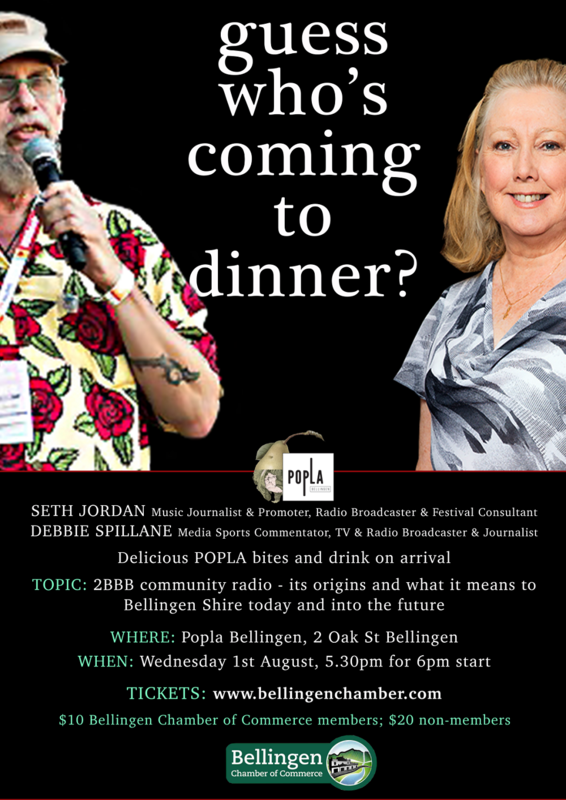 On Wednesday 1st August at 5.30pm POPLA is hosting a Bellingen Chamber of Commerce evening featuring guest presenters Seth Jordan and Debbie Spillane to discuss 2BBB community radio. Seth and Debbie both have considerable experience in the media, and with their current commitment to ensuring a bright future for 2bbb they will be discussing what our community radio means to us today and, importantly, how it will continue into the future. Debbie has enjoyed a career which includes media sports commentator (as the first full time female sports broadcaster with the ABC), TV & radio broadcaster and journalist. She was awarded the Australian Sports Commission Media Award for Lifetime Achievement (AM) in 2017. Debbie will be talking about the work currently being done behind-the-scenes to help ensure the station’s sustainability. Seth’s career history has included music journalist, promoter, radio broadcaster and festival consultant. He has been part of the fabric of our community radio station since its inception and will be sharing the story of the station’s journey – from its humble origins to where it is now. Join them for some delicious Popla bites and a drink on arrival, and be part of the conversation. They would love to see you there. Tickets are just $10 for Chamber of Commerce members and $20 for non-members. Popla bites & drink included.